New Norfolk III are the 2016 T20 seventh grade champions. 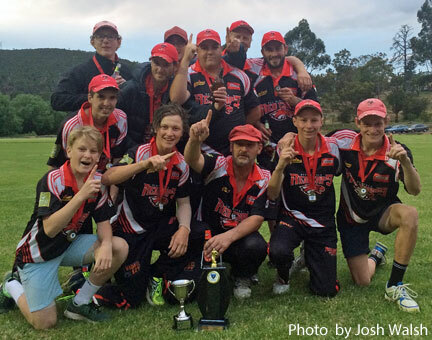 A NEVER-SAY-DIE never say die attitude saw New Norfolk III take out the Seventh Grade Twenty20 Super Bash Grand Final last Thursday night. After being bowled out for just 83, the Red Caps knew they had to pull out all stops to have any chance of victory in the match that counted. And this they did, bowling out the Weily Park Rockers for just 40 runs. Opening bowlers Graeme Rowlands 1-11 and Jake Bearman 1-9 off their four overs began the pressure that was never eased. Then came the man of the T20 final, Cody Morgan-Coleman. After taking a hat-trick in the semi-final, the 16 year old again turned it on taking 2 for just 6 runs off his four overs to give him man of the match honours. Stuart Muir also showed his ability when it mattered most, taking 2-13 off his four overs. In the field the bowlers were backed up superbly with four run-outs of the Rockers batsman being effected. Earlier with the bat, David Mitlemore made 17, while Jye Bearman made 13 (two fours) and Graeme Rowlands made 13no with two fours. Well done Red Caps, it goes to show that in the funny old game of cricket, you are never out of it. In the Second Grade T20 grand final, Gretna I went down to the Knights by 34 runs at Pontville. The Knights made 6/129 off their 20 overs and in reply Gretna made 10/95 off 19.3 overs. Corey Ransley put in a terrific effort with the ball to finish with fine figures of 1-8 off his four overs including a wicket off the first ball of the match. Aaron Maddox took 1-12 (3), Ben Rainbird 1-20 (3), Daniel Browning 1-30 (3) and Peter Jelkic 1-33 (4). With the bat, Bruce Emery made 24 (two fours), Aaron Maddox -9 (three fours), Corey Ransley 16 (one four, one six) and Rhys Browning 14 (three fours). In the Fourth Grade final, New Norfolk II went down to Bagdad by three wickets. It was a close match with Bagdad having just the one over remaining once the target was reached. Opener Glenn Williams made a very good 40 with the bat, hitting five fours. Liam O'Brien and Josh Walsh took a wicket each. Gretna I and New Norfolk II should hold their heads high as they gave it their best shot and everyone knows that in T20 matches it's a fine line between winning and losing.